In just over a week, Halloween will be here. That means it is almost time to shift gears and consider plans for Thanksgiving. Something that I strive to do in our house is make sure everyone recognizes our blessings and adopts an attitude of gratitude. Even though we strive for this, the practical application can be a challenge. This year I am getting prepared by making ‘fill-in-the-blank’ papers for each family member to use as prompts. 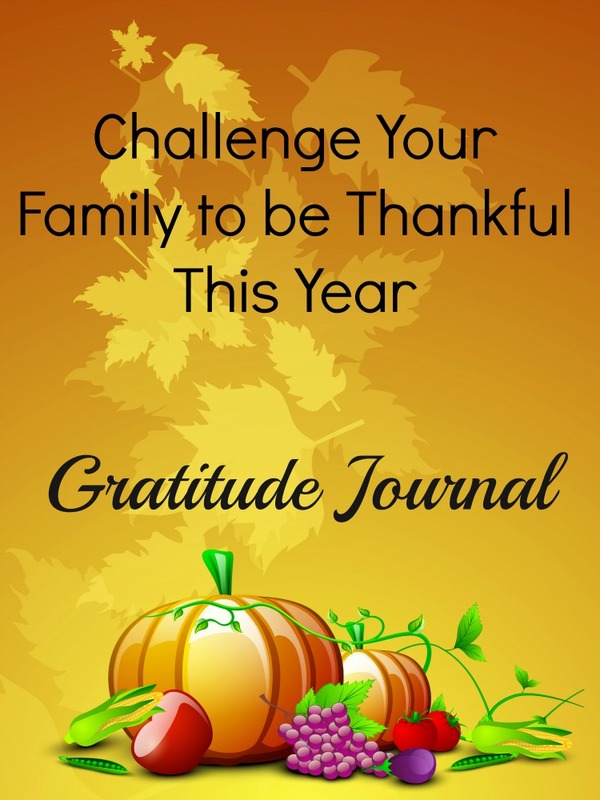 I’m sharing them here in case you’d like to challenge your family to express gratitude this year whether at Thanksgiving or throughout the year. Sometimes this is simple to do. When you receive an unexpected blessing or gift, it can pop quickly to mind to thank the giver. But, expressing gratitude for the people in your lives who know and push all of your buttons can be difficult. I decided to create slips to serve as prompts for my boys and am sharing them here with you. 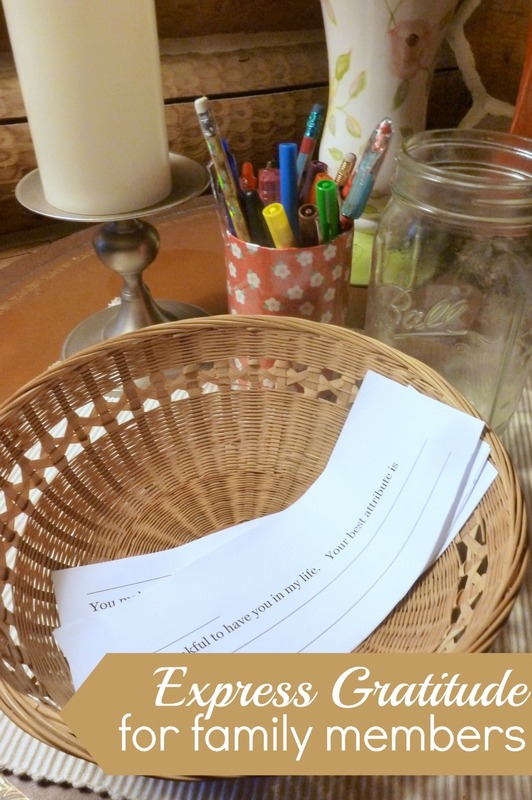 Place the slips in a basket with pens for writing. Put the basket somewhere that everyone can access. 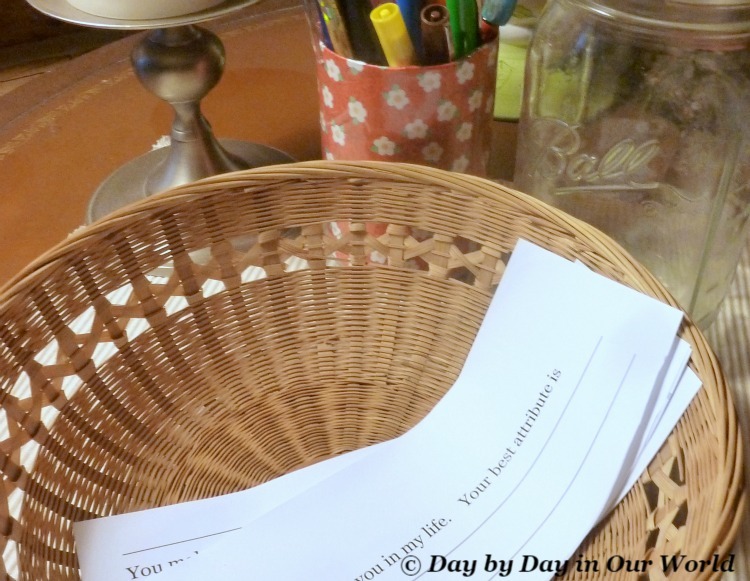 Completed slips can be folded and placed into another basket or mason jar set aside to collect them. Once you are sitting around the dinner table, people can take turns pulling out a slip to read. While these are done as strips of papers, I want to add them to a bound composition book for future memories. 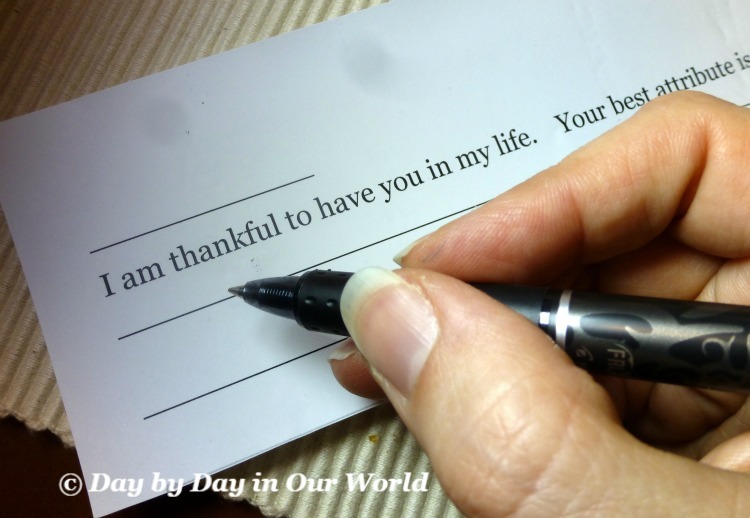 What better way to remember why you love someone when the going gets tough that to look back at a gratitude journal? Your journal could be a pretty journal purchased at the store or a composition book bought during the back to school season. I believe the composition book will work better for gluing or stapling in the written slips of paper. However, if your family members are older, then a pretty journal which everyone can write in would be lovely. Personally, I would love to have one journal per family member so we can all have a way to experience an emotional lift on days when we are down. Does your family take time at Thanksgiving or other family meals to give direct thanks? Have you ever tried to have them write things down? Mini Fall Leaf Decorated Cookies by How Was Your Day? That is such a wonderful idea. We do something similar on Thanksgiving. 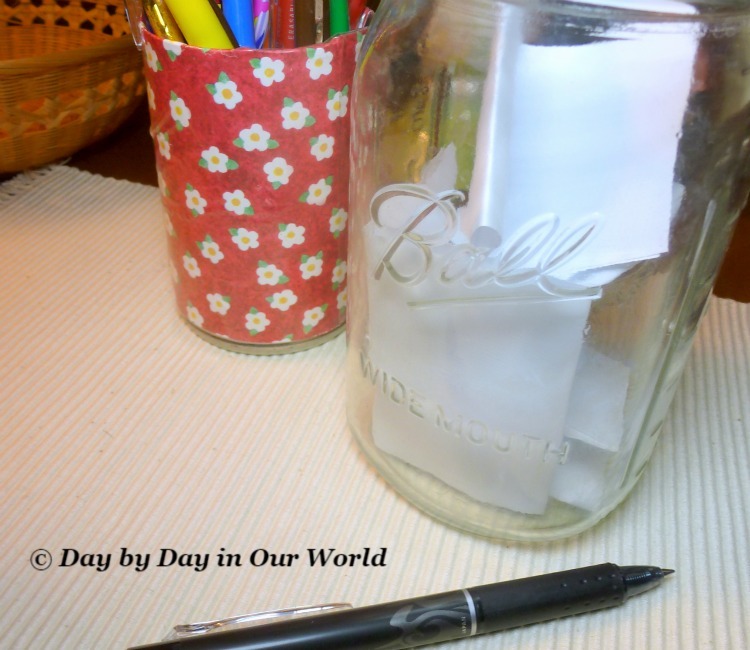 This year though, I have decided to do a 30 days of gratitude scrapbook for the entire month of November. I hope it reminds me that I need to be continually thankful for the blessings in my life - not just on Thanksgiving. I am thinking about doing the same thing, too, Jen. Although it might be ME keeping a daily journal and do a weekly one with the boys. What a wonderful idea. It's so easy to forget to be thankful for our family members. That's why it popped to mind. It can be much easier to see all the faults rather than the positives. This is such a great idea for any family! I will definitely be doing this with my family in the near future! It is always great to be thankful and this is such a great idea. We did place mats one year with the theme of beinging thankful. I like the idea of placemats! That would have been great when we had multiple families under one roof as the kids could be creative and occupied.